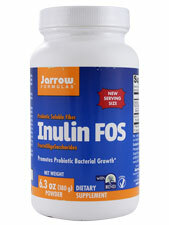 Product Description: Inulin and FructoOligoSaccharides (FOS) are soluble prebiotic fibers that promote gut and overall health through their fermentation by gut flora to yield important metabolites, including lactic acid and the short chain fatty acids acetate, propionate and butyrate. These metabolites help to maintain proper pH in the gut, discourage the growth of unfriendly bacteria, reduce the absorption of toxic ammonia and positively affect bone health by increasing the bioavailability of dietary calcium. * Moreover, acetate, propionate and butyrate promote the integrity of the intestinal cells lining the colon and promote healthy lipid metabolism. Warnings: If you have a medical condiiton or are taking medications, consult your healthcare professional before using this product. Keep out of reach of children. Additional Info: Packaged by weight, not by volume. Suitable for vegetarians/vegans. Does Not Contain: Wheat, Gluten, Soybeans, Dairy, Egg, Fish/Shellfish, Peanuts/Tree Nuts. Suggested Use: Mix 1 heaping scoop (3.8 g) into water, juice, protein drink mix, smoothie or other beverages. Take 1 to 2 times per day or as directed by your qualified healthcare professional.